This rather uncommon pezizoid fungus appears on woodland tracks and occasionally on woodchip mulch. 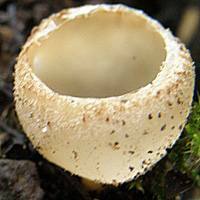 The Toothed Cup is a neat, inedible little fungus and rarely jostles its neighbours for growing space. Like so many of the cup fungi, identification is almost impossible without microscopic examination. Tarzetta scotica is considered by some authorities to be a synonym, while others - Class it as a separate species. Viewed at a macroscopic level the two are virtually identical. Uncommon but widespread across Britain and Ireland, Tarzetta cupularis is found also throughout mainland Europe and in parts of North America. When in 1753 Carl Linnaeus described this ascomycete fungus he gave it the binomial scientific name Peziza cupularis. The currently-accepted scientific name dates from 1981, when Czech mycologist Mirko Svrček (b. 1925) transferred this species to the genus Tarzetta. Synonyms of Tarzetta cupularis include Peziza cupularis L., Pustularia cupularis (L.) Fuckel, and Geopyxis cupularis (L.) Sacc. Tarzetta, the generic name, is almost certainly a corruption of the Italian noun Tazzeta meaning 'little cup' - a reference to the diminutive size and general shape of fungi in this genus. (Tazza in Italian means cup, and probably comes from the French noun Tasse which has the same meaning.) The specific epithet cupularis is derived from Latin and means 'like a little cup'. The fruitbody comprises a fairly deep cup 0.6 to 2cm across often with a short buried stem; the inner surface is smooth, light ochre while the outer surface is also cream to light ochre but downy; its margin is incurved and becomes finely toothed when fully mature. 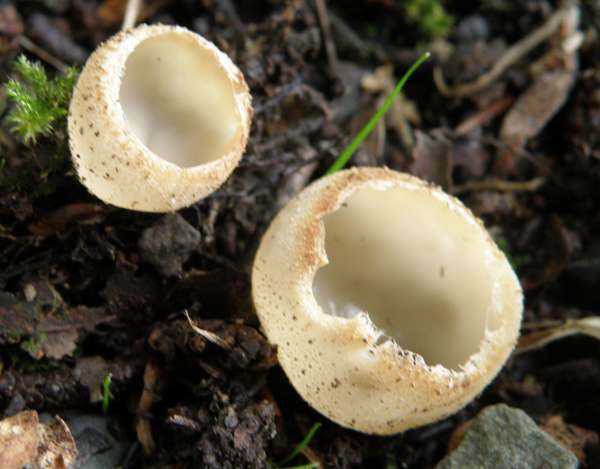 The whitish stem is up to 1cm long and 2-4mm in diameter. Ellipsoidal, smooth, 20-22 x 13-15µm; hyaline, with two large oil drops. On woodland tracks and occasionally on sawdust heaps and woodchip mulch. Like the majority of the ascomycete cup fungi, this species is inedible.